Some time in the last few days, browser-based music tool Yottamusic went kaput. For those of you who never saw it, the site was brilliant. Like the Rhapsody music service, Yottamusic featured all-you-can-listen music for a subscription fee, all playable in a cross-platform browser. (Yes, even Firefox for Linux worked just fine, thanks to a Firefox extension.) Unlike Rhapsody, Yottamusic had an interface that was actually attractive and usable, and synced plays to the music community Last.fm. Social features let you easily discover music via what other Yottamusic listeners liked — not a new idea, but powerful when integrated with a subscription music service. At least Yottamusic died a graceful death: playlists created on the site can be exported as XML and even uploaded to Rhapsody.com. A lot of websites may not go as gently into that good night, or, um, whatever. 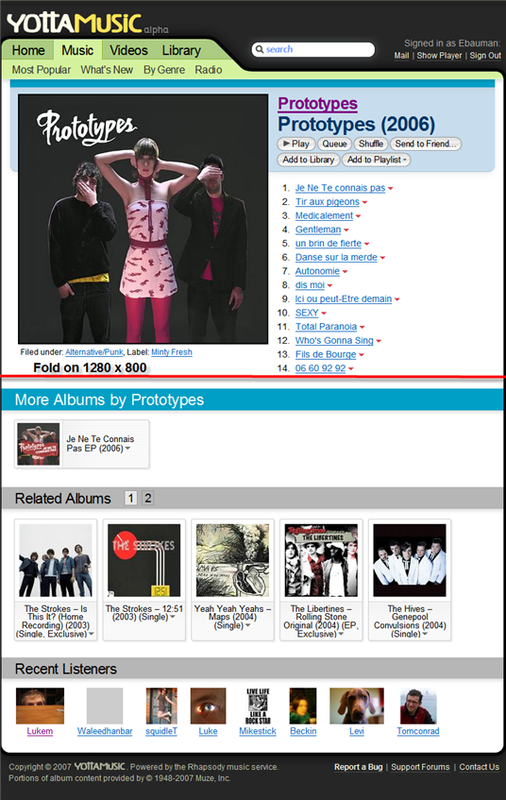 getcha.info demonstrates why Yottamusic’s Web interface was good design, and Rhapsody’s was awful. Now, some of this makes some sense. Yottamusic itself was a creation of Rhapsody. In fact, the logical next step would be to ditch Rhapsody’s clunky, obnoxious interface with animated album covers and whatnot, and learn from Yottamusic’s cooler social features and sleeker interface. Let’s see, did th– nope. Why kill bad ideas and maintain the good ones when you can do the reverse? It’s hard not to feel like subscription-based music in general is not long for this world. MTV’s Urge, ironically the service that had been touted for having the best interface, was folded into Rhapsody last year. With the loss of Yottamusic, choices in general are poor. Yahoo Music has poor editorial content and selection and a painfully-clunky music player. Microsoft’s Zune subscription service is tied to that player; you can’t even download the software without a Zune of your own. And even Microsoft is pushing DRM-free downloads for Zune more than subscriptions these days. Rhapsody has Web compatibility, TiVo integration, better editorial, and better selection. But its Web interface is painful and sometimes unstable, and its music player has an overdesigned UI coupled with only bare-bones features. (It’s also still unsupported on Vista.) Napster, like Rhapsody, works in a Web browser, but has some interface and selection issues of its own. I’ve used these off and on, but to be honest, Yottamusic was the only site that really gave me a reason to keep up a Rhapsody subscription, the interfaces on these tools is so bad. But I have to say, I’m at least a little sad to see subscription music services in such poor shape. Yes, the native players have worked only on Windows, and yes, people have complained about the DRM portable files from these sites employ. But I think when these services worked, it was as a self-programmed “radio station”, or as a way of sampling tracks and albums before buying without having to listen to short samples or downgraded audio. In either of those cases, you don’t really care about DRM because you don’t need to move the file, or even download it at all — streaming and Web interfaces have plenty of potential. The big difference, and the reason these services require the fee, is that they offered true, on-demand music. I still buy lots of music, but supplementing that with unlimited on-demand tunes is a good thing. Yottamusic proved that it was the implementation, not the concept, that needed to be revisited. For that, I’m sorry to see it go — and I really hope someone aside from me noticed how good it was. CDM Asks: What’s the Best, Low-End Visualist Camcorder?